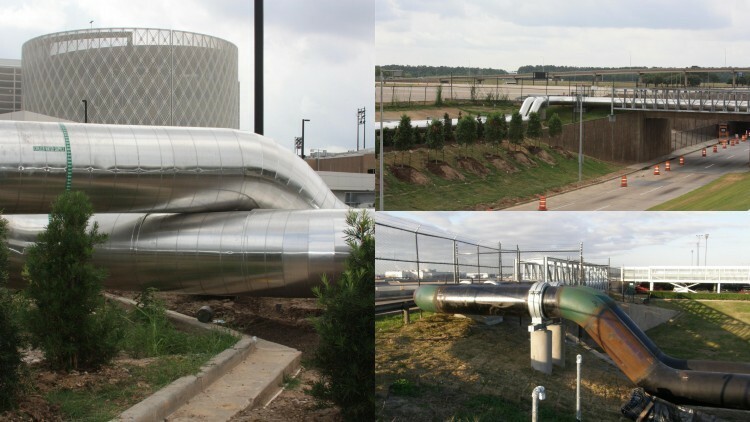 This $17.3 million dollar prime contract included stringent Homeland Security measures which resulted in multiple restrictions being placed on the installation of over one mile of 36” heavy wall carbon steel pipe that needed to be installed within the restricted access areas of the airport. Additionally, the construction of four bridges over heavily traveled roads and one underground road transit would be required in order to route the newly installed piping. Given the emergency nature of the project, all work was required to be completed in just 7 ½ months. ACI Mechanical assembled a project team of talented engineers, including civil, structural, and landscaping as well as specialty subcontractors to in order to submit a $17.3 million dollar GMP and construction methodology to HAS to install a replacement overhead piping system with routing plan and support structures. Understanding the significant nature of a potential cooling system failure and shutdown at the Houston Airport impacting operations and thousands of travelers CSUSA/ACI work up to seven days a week including a significant amount of overtime and night shifts to complete the piping project ahead of ahead of the high demands of the summer cooling season.